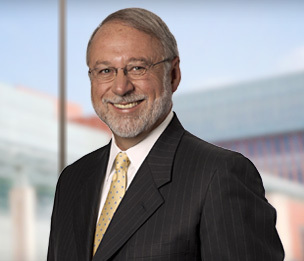 James P. Greene possesses over 35 years experience in the negotiation and administration (including grievance and Act 312 interest arbitration) of labor agreements on behalf of public and private employers, including K-12 school systems, colleges, universities, manufacturing and service firms, electrical cooperatives, hospitals, nursing homes, courts, cities, and counties. Mr. Greene's practice is exclusively directed to representing management in labor and employment matters. He has negotiated hundreds of labor agreements covering K-12 faculty, university faculty and lecturers, administrative and professional employees, nurses, assistant prosecutors, accountants, technical employees, probation officers, police, maintenance and food service employees, skilled trades employees, clerical and secretarial employees, linemen, manufacturing and production employees, court employees, bus drivers, health department employees, mental health department employees, and numerous others. The unions with whom he has negotiated collective bargaining agreements include the MEA, MFT, AAUP, AFSCME, IUOE, UAW, FOP, MESA, IAFF SEIU, POAM, United Steelworkers, IBEW and others. Mr. Greene formerly served as Director of Dykema's Employment Law Department and as Member in Charge of Dykema's Ann Arbor office. He has also served as head of Professional Personnel with administrative responsibility for all of the Firm's associates and paralegals. Prior to joining Dykema, Mr. Greene served as a Labor Relations Consultant with the Michigan Association for School Boards, taught labor negotiations, contract and grievance administration and personnel management at Lansing Community College, and served as a Principal to The Wyatt Company consulting on matters of compensation program design and administration. He also served as Executive Director of Human Resources for Eastern Michigan University where he was responsible for legal affairs, faculty and staff labor relations, compensation, benefits, employment, affirmative action, workers' compensation and unemployment compensation administration, and staff training and development. Mr. Greene is actively involved in the community and serves on the Board of Directors and Executive Committee for the Ronald McDonald House in Ann Arbor, Michigan. He has also served as Vice Chair of the Eastern Michigan University Foundation Board of Trustees and Chair of the Foundation's Development Committee. Mr. Greene is also a member of the National and Michigan Public Employer Labor Relations Association (MPELRA) and the Michigan State Bar.